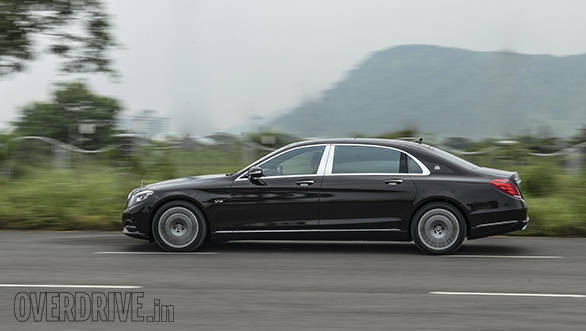 Last year, we drove the top luxury cars in India and came to the conclusion that the S-Class is indeed the benchmark. Mercedes-Benz calls it the Best Car in the World and you can't deny that. It's the car that maps out the route that the auto industry as a whole gets inspired by. It normally takes a few years for competition to catch up with this Mercedes, but it seems like that's going to be pushed back a few more. Why, you ask? That's because the German carmaker has decided to make the S-Class even more exclusive by introducing the Mercedes-Maybach S 600. Honestly, I didn't expect to see the Maybach make it to India this early. In fact, only recently did Daimler confirm that the brand would make a comeback and become Mercedes' sub brand. The production car was only unveiled in Geneva this year but within a few months has officially been launched in the country. The Mercedes-Maybach S 600 is based on the S-Class and is the reason it looks like one too, especially when viewed head-on. Apart from a slightly revised bumper and grille, there isn't much to distinguish the two. It's the same story at the back too  the only difference being the inclusion of Maybach badging. Move to the sides though and the similarities come to an end. Mercedes strengthened and lengthened the S-Class' body. The car is longer than the long wheelbase S-Class by 207mm. The increased wheelbase adds to the length and as a result, the rear passenger gets more space. Special 19-inch wheels feature a very elegant design and if needed, one can also get optional 20-inch rims too. It is a very long car but interestingly is still shorter in length compared to the older Maybach 62. Look at the C-pillar and you'll see a small fixed window  this helps differentiate styling from the S but more importantly pushes the rear passenger further back for greater privacy. Unlike the predecessor, this car doesn't get the iconic Manufaktur emblem on the hood but on the pillar. This doesn't make sense to me. I would have liked it if the emblem was up front instead of the Mercedes star logo. 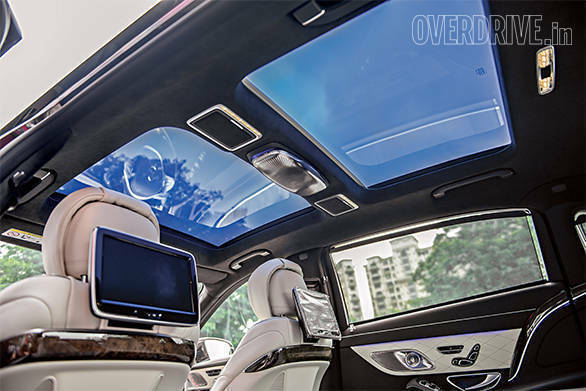 Step inside and one is pampered with an S-Class like interior and because the wheelbase is increased by 200mm, the additional room is immediately felt when one's seated in the back. The interior combines sumptuous materials including Nappa leather, metal and wood for an unforgettable luxury experience  it can't get more upscale than this. The separated rear seats are like first-class airline seats and to make it even more comfortable, the extended leg support gets an additional cushion. The seats also offer cooling and heating. Then there are the various massage functions that are now available on all seats (the driver's seat included). I ended up using the hot stone massage more than once, as it was a cold and tiring day when we tested the car. There is also a thermo cup holder that changes colour from red to blue while heating and cooling. Missing, however, is a refrigerated compartment and champagne flutes, both features are available as an option though. If you need some shuteye, then the seat behind the co-driver gets almost 80mm of additional legroom. In this mode the seat is almost fully flat. There's also support for the calf and heel and extra cushions for the headrests. Ambient lighting is probably the best we've seen in any luxury car and this adds to the experience. 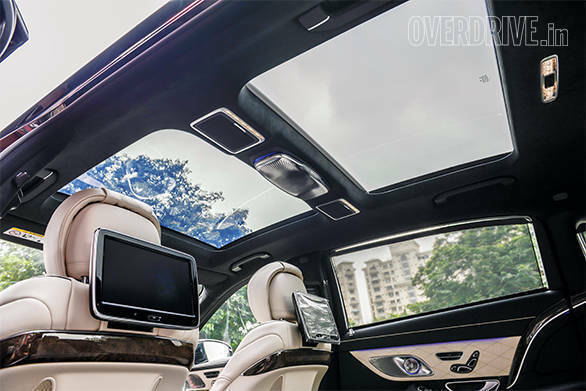 The car also features a panoramic sunroof that gets Magic Sky control. This feature turns the roof from transparent to tinted at just the touch of a button. The system electrically aligns tiny particles in a thin film within the glass, so you can choose between keeping your cabin cool or create an open-air feeling. The Mercedes-Maybach is also a very quiet car to be driven around in. The carmaker claims that the cabin is the quietest of any production sedan in the world thanks to the use of special seals and acoustic deadening behind the rear seats to name a few. Wind noise at high speeds is like a whisper and on the move, one can barely hear the motor. The saloon gets the flagship 6.0-litre V12. This is the first S-Class in India to get this engine and it makes sense to debut one of the world's top V12s in the Maybach. 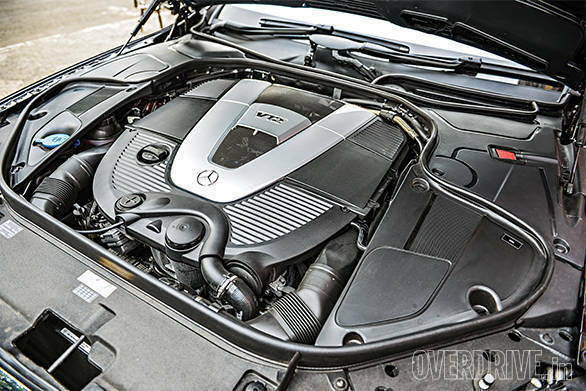 The biturbo petrol produces 530PS from 4,900rpm to 5,300rpm while peak torque is a colossal 830Nm that's available at 1,900rpm. On the road, the V12's acceleration is effortless and smooth. The car cruises at triple digit speeds with the tacho only reading a little more than 1,000rpm! Hold steady throttle and there's constant surge of torque being sent out. Even a slight tap on the throttle is enough to make quick overtakes. The proven 7-speed automatic isn't a very quick shifting box but offers smooth gear changes. Step on the throttle and the 2.3-tonne car actually catapults ahead. While most owners will be chauffeur driven, one has to experience the sheer power of the V12 behind the wheel. The motor comes to life when given the beans and does get slightly audible, despite the acoustics we just talked about. Speeds rise in no time and before you know it, the car crosses 200kmph. Mercedes claims that the car reaches 100kmph in 5 seconds. In real world conditions though, the S-Class Maybach managed to hit the ton in 5.9s. This is still a very impressive figure considering the car's weight. Powering twelve cylinders does require a lot of fuel. In the fuel tests, the car managed to return 4kmpl in town and 7kmpl on the highway, translating to an overall figure of 4.75kmpl. The ride on the Maybach is, quite simply, great. The 19-inch wheels and the air suspension make sure the ride is plush even over bad roads. The thuds can be felt but over broken surfaces, undulations and small bumps, the car simply glides, no matter what the speed. The good news is that the Magic Body Control finally makes it to India. The system uses cameras that read the road ahead and alters the suspension characteristics. The ride is better than the standard S-Class but it isn't a huge step up. The air suspension offers two modes as standard ? Comfort and Sport. In Comfort, the Maybach feels relaxed and is best experienced at slow speeds. However, this mode displays quite a bit of body roll. The Sport mode firms up the ride, and interestingly, it also alters how the steering feels and reacts. The whole setup feels a lot firmer and though driver involvement still remains low because of the lack of feedback coming through either the steering or the chassis, it felt a lot more comfortable than before. The long wheelbase does affect handling but it still is very predictable and never a concern. Also one should remember that the Maybach is a car not meant for tackling corners and twisties. But it feels absolutely brilliant in a straight line, even when driven flat out. As expected from a flagship model, the Mercedes-Maybach S 600 offers just about every comfort and safety feature as standard. The Burmester stereo offers one of the best audio experiences in a car and it only gets better in the Maybach. In terms of safety, the S-Class is the first car in India to offer 12 airbags. This includes the rear-seat beltbag, an inflatable seat-belt strap that reduces the load on the passenger's ribcage in the event of an impact. The car also gets night vision with pedestrian detection. 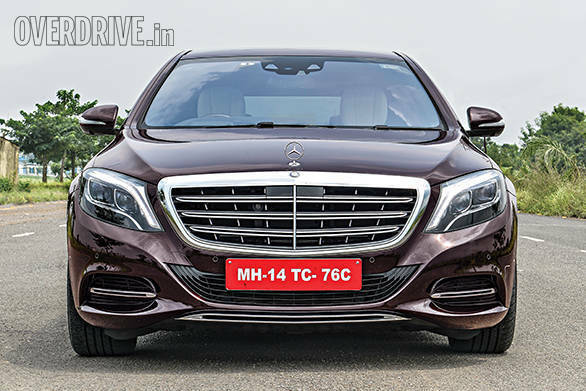 The Mercedes-Maybach S 600 is on sale now and it's priced at Rs 2.6 crore, ex-Pune. This makes it nearly twice as expensive as the regular S-Class. However, with this car, Mercedes actually has what it takes to compete with the likes of Bentley and Rolls-Royce. The car offers a lot more features, a beautiful V12 motor, path-breaking technology and equipment at a lower price point. Maybach has made a great comeback and in the process, made the S-Class better than ever before.